OMAHA, Neb. (KMTV) — For the first time in nearly 20 years the Kansas City Royals were in Omaha taking on their Triple-A affiliate. 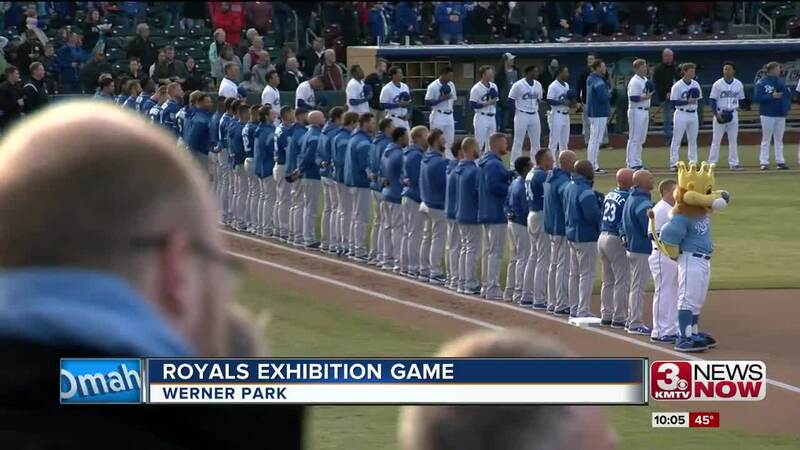 On Monday evening the Omaha Storm Chasers hosted the Kansas City Royals at Werner Park. It was the Royals first game against the Storm Chasers since 2000 and the team's first since the Storm Chasers moved to Werner Park. The two teams were originally scheduled to play in 2018 but the game was canceled due to rainy conditions. "We thought it was really important that we brought the fans back to town for our supporters and our tickets holders to witness this game at Werner Park," said Assistant General Manager Sean Olson. In front of a sold-out crowd of nearly 9,000 fans, the Royals of the present and of the future took the field for a final tuneup before the regular season begins later this week. "I think it's exciting," said Andrea Schneider, a Storm Chasers and Royals fan. "I'm enjoying the turnout that we have here, it's a great turnout." Major leaguers never want to return to the minors. But for the fans, it gave them a chance to root for their old favorites. "That's how I became a fan of the Royals," Schneider said. "You watch all of the guys who helped get them that championship and that's how you become a fan." But the biggest dilemma for the fans was whether to cheer for the hometown Storm Chasers, or the major league Royals. "It had to be the Royals because you couldn't lose to your minor league team," said Jesse Kimball, a fan of both teams. "It will be both," Schneider said. " I'm a Royals fan for sure but I always root for the Chasers."